David Payton: Singer, Guitarist, One-Man Band, Entertainment For ANY Event! -"Great singer" "Amazing guitarist" "Who needs a band?" "Everyone loved David" "People kept asking where we found him! They were so impressed!" "David made our party!" "Music makes or breaks events. Your guests will remember your entertainment long after the food and decor are forgotten. You won't find any better solo act than David Payton. He is the real deal!" - Matthew Cutillo, GigMasters #1 Artist for the last six years. David Payton is GigMasters' #1 Singer, Guitarist, One-Man Band in the USA! You're planning an event, want more than just 'a guy and a guitar' and know a BAND is too big, too loud, too expensive and way too much hassle. David Payton is your solution! He brings the sound of a full band, but for the budget, logistical and space requirements of a top quality solo artist. He can play as loud (or as soft) as YOU want! Planning a WEDDING? David can do it ALL... Prelude, Ceremony, Postlude, Cocktail/Dinner Hour and the whole Reception! David can play acoustic/classical (or any special requests) for the Ceremony/Dinner Hour and then rock the Reception dance floor with over 3,000 watts of top-of-the-line Digital PA and DJ-style dance floor lights. For your Reception, David will sing and play live and, if you want, he will gladly DJ the last portion with classic party songs and today's dance hits for modern dance music fans. Think of the money and hassle you'll save just dealing with ONE PERSON for all your wedding and reception music needs! 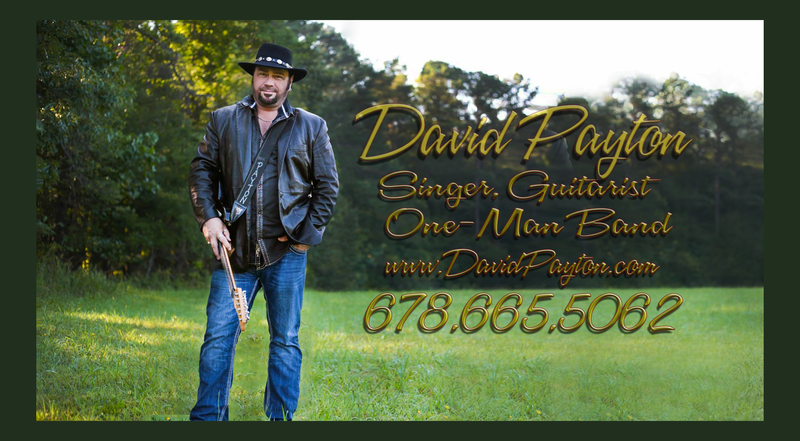 Bottom line: Book David Payton and ALL your Wedding AND Reception Music worries are over! David understands that success in the entertainment business requires more than just talent. It requires hard work, being responsible and being prepared. He will do all he can to meet (and exceed) his clients needs, & make their event a pleasant and unforgettable experience for everyone. David has done his one-man performances for a wide range of events. He has performed for Condoleeza Rice and 25,000 others at the Georgia World Congress Center, entertained for corporate events for Sprint, Kyocera, Samsung, the Masters Golf Tournament and many more. David has also played fund raisers for Wounded Warriors among others, and has been featured in multi-week runs at MGM Grand and the Golden Nugget Resorts and Casinos. David has pleased clients for hundreds of weddings, parties, events and concerts. He has delighted clients and audiences from the North Carolina Coast to the Mississippi River, from Nashville's Opryland to Florida's Palm Beach social elite. But he is just as comfortable playing for a few dozen people at a neighborhood party or a backyard barbecue. Audiences of all ages love David. He excels at most every style: Rock, Country, Blues, Pop, Classic Rock, Motown, Acoustic and Electric. He has a huge repertoire of songs everybody knows and loves. He has an ability to read the crowd and play appropriate music that comes only with decades of performing experience. He has played both as a solo artist and with Grammy Award winning bands all over the US, Canada, the Caribbean, Mexico, Italy and Israel. He has shared the stage with many well known national music artists, and played for numerous State Governors and Ambassadors. Any popular style you want, David delivers with energy, personality & FUN! His huge song list is always growing. Whether it's Jack Johnson, James Taylor, Eric Clapton, Johnny Cash, John Mayer, Zac Brown, Jason Aldean, Stevie Ray Vaughan, Temptations, Earth Wind & Fire, Van Morrison... David plays Rock, Blues, Country, Classic Motown & everything in between with a talent and professionalism that will please you and ALL your guests! We challenge you to find a performer, solo or band, who can provide a better entertainment experience for even double David's fee range. You won't. We guarantee it! ~"DAVID THANK YOU SO MUCH FOR BEING A BIG PART OF MAKING OUR PARTY SUCH A SUCCESS!!" ~"Perfect! True professional. We're thrilled & will hire him again!" ~"David was FANTASTIC! Very professional & very talented!" ~"David blew us away! Fun, Engaging, & just d-n good!" ~"David really made the party fun!" ~"Awesome! His demos don't do him justice." ~"Phenomenal performer. Everyone's gushing how awesome he was!" ~"His talent is exceptional & his showmanship is top-notch." ~"It's foolish to hire anyone else!" ~"Amazing talent. Far better than any performer I've seen at a wedding reception." ~"We can not recommend him enough!" ~"The music was great, and HE was really great, too! So much so, I'm booking him for MY wedding!" * DEEJAY SERVICES: David will gladly DeeJay your favorite recorded dance/party playlists through his top of the line Bose sound system during breaks, or for the entire last set, so ALL your guests, young and old, will be dancing all night!